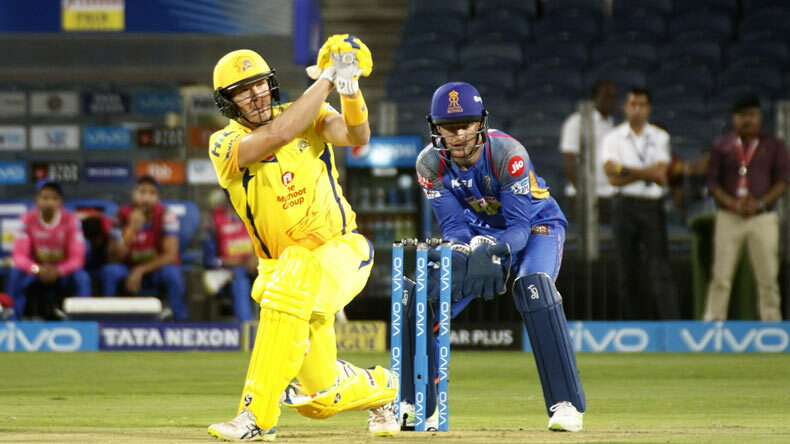 Australian all-rounder Shane Watson continued his stellar run in the 11th edition of Indian Premier League (IPL) on Friday as the Chennai Super Kings opener struck a quick fire 106 in just 57 balls against Rajasthan Royals at the Maharashtra Cricket Association Stadium in Pune. Despite the removal of Rayudu in the sixth over by Laughlin, the Australian was keen on punishing the Rajasthan Royals' bowler and completed his half century in just 28 balls. Watson, who used to be the talisman for Rajasthan Royals in the Indian Premier League from 2008 to 2015 came back to haunt his former side on matchday 17 of the 11th edition of IPL. Australian all-rounder Shane Watson continued his stellar run in the 11th edition of Indian Premier League (IPL) on Friday as the Chennai Super Kings opener struck his third IPL century (106*) in just 57 balls against Rajasthan Royals at the Maharashtra Cricket Association Stadium in Pune. Asked to bat first by Rajathan Royals’ skipper Ajinkiya Rahane, the 36-year old opened the Chennai innings along with Ambati Rayudu and gave the Chepauks a bright start by crossing the 50-run mark in just 5 overs. Despite the removal of Rayudu in the sixth over by Laughlin, the Australian was keen on punishing the Rajasthan Royals’ bowler and completed his half century in just 28 balls. The visitors paid a heavy penalty after dropping Watson in the very first over as the Australian helped Chennai Super Kings post 189 in 20 overs. Watson, who used to be the talisman for Rajasthan Royals in the Indian Premier League from 2008 to 2015 came back to haunt his former side on matchday 17 of the 11th edition of IPL. Supporting the Australian, returning Team India batsman Suresh Reina was also instrumental for the Chennai outfit with a decent 46 that came in just 29 balls. While Chennai Super Kings skipper MS Dhoni gave away his wicket cheaply to Shreyash Gopal, a steady Watson moved into the nervous nineties in the fifteenth over. The Queenslander then completed his first century of this edition of IPL in the 18th over to put Chennai in a commanding position. This was Watson’s 3rd ton in IPL that came off in just 51 balls. Along with Dwayne Bravo, Chennai Super Kings continued punishing the Rajasthan Royals in the remaining five overs. Watson also recorded his highest score in IPL and propelled his new side—Chennai Super Kings to register a total of 204/5 in 20 overs.